Presto! Track kits turn dirt bikes into snowmachines. This year's snowpack means plenty of happy snowmachiners out buzzing along on their sleds — but if you think you also hear the sound of dirt bikes tearing up the snow, you're not wrong. 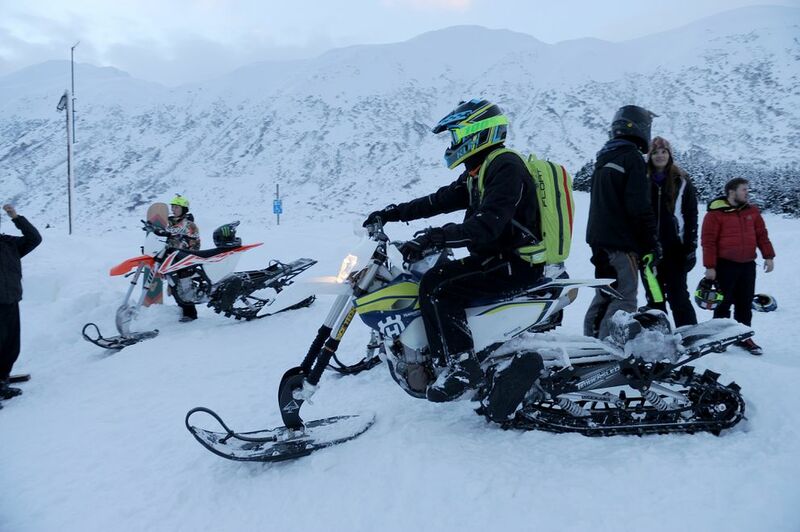 Snow biking — riding dirt bikes mounted on snowmachine-style tracks — is enjoying a boom across the country, and Alaska is catching on. The concept of a standalone snow bike — which positions you higher than you'd sit on a snowmachine, with your knees underneath you instead of in front of you — has been around for decades. But what's really caught on is a track conversion kit that lets you keep using your summer dirt bike year round. The kit sells for $4,800 to $9,000 here in town — admittedly a hefty investment, but one that lets you keep riding your familiar dirt bike year-round. Once the snow melts, remove the tracks and go back to summer riding. Chris Colmenero, service manager at the Anchorage Motorcycle Shop, which sells the kits, says they come with in-depth instructions, allowing anyone with basic tools to make the conversion — so long as they're prepared to bleed the brake lines. "We took a bike off the floor Friday, put a kit on it and raced it on Sunday," he said. The resulting hybrid would make Frankenstein's creator proud: One ski in front and a narrow snowmachine track and integrated suspension in the back, with the familiar handlebar, brakes, throttle and seat of your dirt bike. As you might guess, a converted dirt bike isn't meant for high-marking beside the big, powerful sleds. Instead, you use it much the way you would a dirt bike in the summer, riding among trees and zig-zagging trails. Getting to ride the same bike year-round is a big part of the kit's appeal, as is what Colmenero paints as a more forgiving learning curve than you'd have on dirt: After all, if you're going to fall off, snow makes for a friendlier landing. Snow biking has been picking up momentum in fits and starts — but it took a series of breakthroughs to finally bring it into the public eye. The first, Colmenero said, came when pro freestyle motocross rider Ronnie Renner appeared in a YouTube video, riding a snow bike and proclaiming it was one of the coolest things he'd ever done. That growing niche sport expanded even more in 2015 when Polaris, one of the biggest snowmachine manufacturers in the world, acquired the Timbersled track-mount company. That was also the first year the Motorcycle Shop sold the track kits. In 2015, Colmenero says, they sold one. Last year, it was up to 17 — and they're on track to beat that number this year. 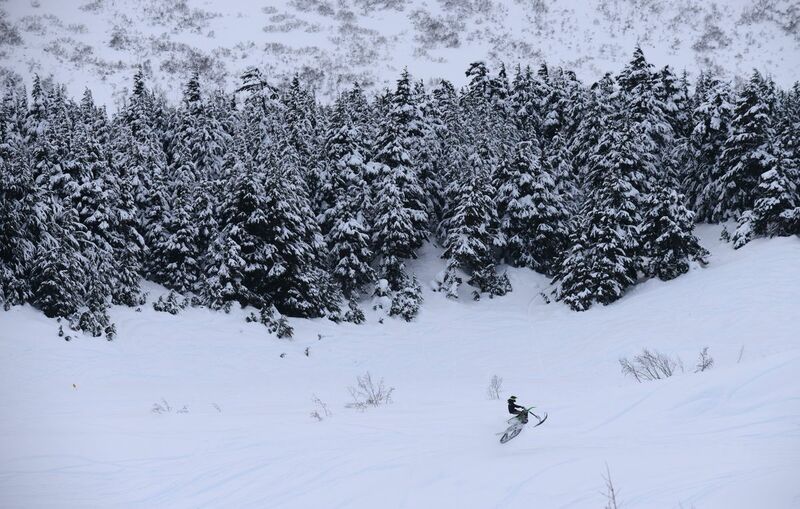 Now, Colmenero estimates, about 100 snow bikes are on Southcentral slopes. That number should only grow, thanks to another boost from the first-ever appearance of Snow Bike Cross at the 2017 X Games. At least three of those bikes belong to young members of the Alaska Motor Mushers Club. Kyle Nicoll, vice president and race director of the club, explained that their biggest racing events focus on kids riding 120cc snowmachines. Getting some of them over to mini snow bike kits has been a fun, natural transition. Even the adults, including accomplished Iron Dog racers, are asking if they can ride the smaller bikes. The club's offerings will expand soon to include adult snow biking. But for now, the focus has been on collecting enough young riders to form a kid's snow-bike racing class. Those kids — with a focus on ages 9 to 13 for now — have been making regular appearances at club events on their snow bikes. You may have seen them running mini freestyle courses and giving demos at events like the Iron Dog ceremonial start in downtown Anchorage. "(The sport) is growing really quickly, and every time someone watches it you'll understand (why). You're like 'Yeah, I want to see that,' " said Nicoll. Nicoll's take on snow biking is a little different than Colmenero's: "A lot more rider input is involved in it (than snowmachining)," he said. One could argue it's all in the mentality: Some people are dirt bikers by nature, while others will lean toward the brute power of a big snowmachine. 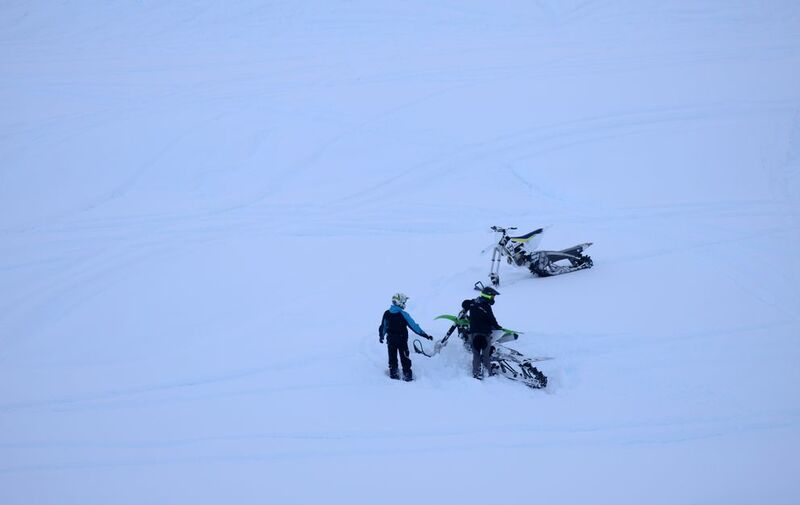 For now, the young snow bikers ride in their own heats on the same track used for snowmachine races. Snow biking isn't an official event for International Snowmachine Racing, Inc., the major international governing body for snow racing, but Nicoll thinks the bikes have become so popular that it'll happen soon. "It'll get there. It has to," he said. Once it does, riders of all ages can start earning points in their local heats. Meanwhile, if your child wants to join the growing snow sled racing class with the club, Nicolls' priority is getting as many people racing as possible. If your kids might be interested, contact him on the club website, ammcracing.org. Even though the sport is focused on kids ages 9 and up, youth categories can include children as young as age 6 on small bikes that are easier for them to control. All a new participant needs is a bike of their choice, used or new, a track conversion kit that can bolt right onto any dirt bike from the "big three" manufacturers — Kawasaki, Yamaha and Honda. The same protective gear riders use on dirt bikes is perfect: shin guards, chest protector, helmet and goggles. Young riders will give demonstrations and race at Alaska Motor Mushers Club events and will be at Arctic Man at Summit Lake April 6-8. Check out the schedule at ammcracing.org. Anchorage freelance writer Lisa Maloney is the author of "50 Hikes Around Anchorage" and another forthcoming guidebook.